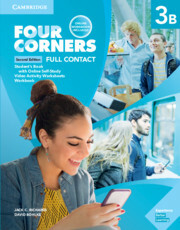 Four Corners Second Edition Level 3 (CEFR B1) combines effective, communicative methodology with a practical, 'can-do' approach. Clear learning outcomes and 'can-do' statements for every lesson, linked to the Common European Framework of Reference (CEFR), help teachers and their students measure the progress being made. This Super Value Pack B includes the Student's Book with Self-study and Online Workbook, plus a printed version of the Workbook, all consisting of the second six units (7-12) of Level 3. 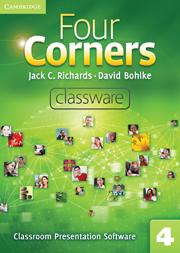 The Student's Book contains a unique code that gives access to online self-study activities and the online workbook.